McFadyen Group - If you would like to find out our excavator hire rates then call McFadyen for quality service and equipment at a great price. 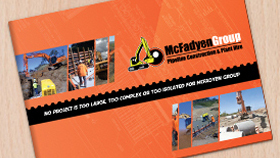 The McFadyen Group provides market leading excavator hire rates in Brisbane. We give our customers premium, modern and reliable equipment, every time. Our equipment is available at any location, at any time. We have a large fleet of quality machines, from trusted and reliable brand names such as Caterpillar, Airman, JCB and Doosan. Every piece of our machinery is carefully serviced and inspected by our highly qualified fitters either at our Brisbane yard, or at your project site. McFadyen have a strong reputation for quality services, which means you can trust you will receive the best machine for the project you are undertaking. We ensure the best excavator prices for our clients because we want you to be completely satisfied with our services. If you would like to learn more about our services and our equipment then take a look through our website, or alternatively feel free to give us a call. One of our friendly staff members will happily answer any questions you may have, and also provide you with a quote upon request.